The Kindle Fire doesn't have nearly as many accessories as the iPhone or the iPad but it is beginning to get a nice selection of docks. I've just happened across an alarm clock dock for the Kindle Fire. iHome released it in August, and it does not seem like many bloggers noticed (I didn't see anything). The iHome iK50B dock was designed to work with the original Kindle Fire, not the Kindle Fire HD.The dock will let you charge your KF, play music from it via the dock's speakers, and more. 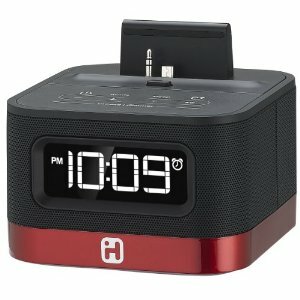 When combined with iHome Sleep, the free Android app from iHome, the dock will let you change the alarm tone or wake to music on your Kindle Fire. Or at least you are supposed to be able to play your own mp3; a couple reviewers say that this feature didn't work. Another reviewer indicated that the dock couldn't charge his original Kindle Fire. I happened upon this dock late Sunday night when Amazon was selling it for $20 off the regular retail of $60 as part of a Gold Box deal. My unit is on its way to my home and will likely arrive before I am back from San Francisco. When I get back I plan to try this dock and the related app and post a review. They sell this at Target for $49.99. You know, I think I may have seen it in my local store. I didn’t realize it was for the KF.